My boy loves history, so we could not wait to review In Freedom’s Cause Single Package by Heirloom Audio Productions. 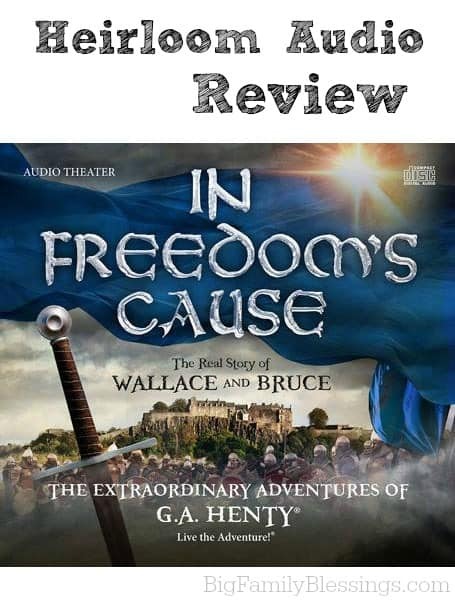 In Freedom’s Cause is the real story of William Wallace and Robert the Bruce. Written by G. A. Henty and adapted for audio dramatization, this story will have your entire family on the edge of their seats. I suggest listening for the first time on a long car ride, because I guarantee you that you won’t be able to get out of your car for the entire 2.5 hours! I received the Family Four-Pack of In Freedom’s Cause for review, which includes not only the audio cd, but also many other great bonus features. Including a study guide & discussion starter, the soundtrack, the original GA Henty book in e-book format with new colorful graphics, the mp3 download (perfect for your child’s iPod! ), a beautiful printable copy of William Wallace’s prayer, a cast poster, a cast of characters roadmap, a behind the scenes documentary, and membership to website containing extra helpful resources! This gripping story will have your child’s imagination on overdrive, it’s certainly not just any old book on tape. This is a dramatization, not just a book read aloud. The cast includes the voices of actors from Downton Abbey, Lord of the Rings, Chronicles of Narnia and Braveheart! 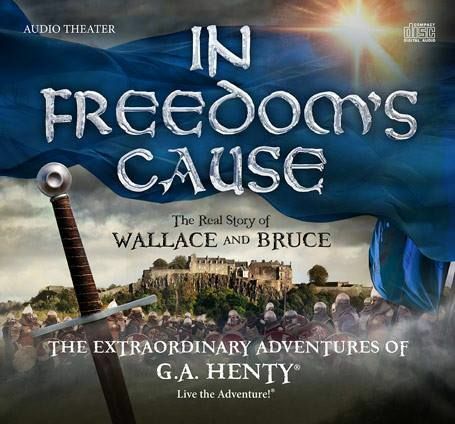 Listening to In Freedom’s Cause is just like watching a movie with your eyes closed- you’ll hear the fire crackling, swords clashing, and more! I started this cd in our car during errand day. I definitely don’t recommend doing that. We found ourselves sitting in parking lots, unwilling to pause the story to run inside and complete our errands! I really loved the study guide & discussion starter, which is perfect for homeschooling! The first time through we just listened to the story for pleasure, but on subsequent days we used the study guide and discussion starter which includes 30 pages of In Freedom’s Cause discussion points, history-learning guides and story-related Bible study. Each time the story takes a turn (about every 4-10 minutes) the study guide provides questions for listening comprehension and further discussion, as well as vocabulary. The story was so captivating, that I didn’t feel the need to go through each listening comprehension question- there was no question that we were all listening intently. However the questions were really great for my younger children to help make sure they understood the action. The vocabulary section is great- some of the words used a very old and even I didn’t know what they meant. Having the words listed in the study guide made it easier to google them! The discussion questions provided are excellent, detailed and thought-provoking; they could also be used as short essay questions. I also really appreciated the brief overview of Scotland’s history during this time (and list of recommended reading). Keeping up with all the different history assignments in our homeschool can be difficult- this quick refresher allowed me to quickly catch up. Don’t just listen to my opinion! Check out reviews from other member of The Schoolhouse Review Crew here. Oh my goodness, I know exactly what you mean! We can just sit and listen to it straight through, too! There were so many times my intent was to just listen to one or two sections, and before I knew it we had gone through four or five!